Posts categorized "5 Tips Designers Know(c)"
Ever liked a stamp --except for the fact that it was a little too big? Large-image stamps can be tricky to use and often don't work with your favorite layouts. I've used a big teddy bear stamp on this cards to illustrate some quick layouts you can use with any large-size main images, and common mistakes to avoid when designing. Enjoy this design tricks article and watch your stamping skills improve with Song of My Heart's simple principles for papercrafting you can be proud of. 1. This first layout is a basic vertically-oriented card base, with the large image placed center above the mid-line. Patterned paper down below (4.25 x 2.5 inches) helps the card balance and reduce top-heaviness. Not sure what I mean? Imagine this card without the patterned paper at the bottom (it helps if you squint). Does the main image appear to loom towards you? That's top heavy. 2. The second layout is composed of all the same pieces, but they are grouped in the middle of a horizontally-oriented card base. The patterned paper is not needed for balance, so it's pulled in from the left edge. The main image is pulled in from the right edge. And the long banner sentiment unifies all three elements into one. Overlapping part of a large stamped image with an element from the card helps it blend in instead of stick out awkwardly. Side-note: aren't these bears adorable?? 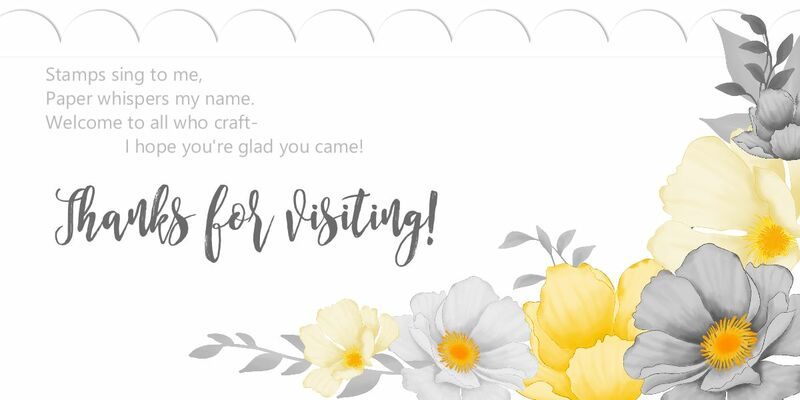 I'm using the cute new "photo-realistic" stamp set Baby Bear and his/her accessories and sentiments for my sample cards, with Soft Sky and Marina Mist for the boy cards and Blushing Bride and Rose Red for the girl ones. Both sets use Irresistibly Floral specialty pre-embossed Designer Series Paper in the open polka-dot pattern. I sponged it to add background color and used my Marina Mist marker to add a swipe of color to the centers (boy cards only). 3. The third layout is a basic horizontally-oriented card base with a long strip of patterned paper running the length of the bottom. There's also ribbon running horizontally across the card. However, there's enough visual "upward thrust" to the main image itself that it helps balance the horizontal together with the vertical row of brads. A common mistake is to match too many elements and not have any contrasting movement. Contrasting movement is actually a good thing, done correctly. 4. Can't get it to fit? Tilt it! Sometimes the combined elements and large main image are just not going to fit together smoothly. The answer can be tilting one (or at the most two) of the elements to allow room for all the pieces and still leave a bit of "white space" for the eye to "rest." In the case of this layout, the resting space is served by the space around the tilted image. Because it's slanted, more of the background is exposed in two key white-space areas: the upper corners. 5. The final layout shares another potential problem with large image stamps. Sometimes, the sentiment we want to use is much smaller than our main image and out of proportion to it. We can help alleviate this discrepancy by moving the main image out of it's "power position" (sliding it to the left edge) and beefing up the sentiment (see the faux-folded banner trick here). The patterned paper has been drawn up to support the sentiment, which is stamped in dark ink to further bring it out. I hope you've enjoyed the five cards I shared today! If you're a fan of the whys-and-wherefores of good design, you'll LOVE the "Five Tips Designers Know" articles on my blog. Be sure to check out the Cheat Sheets Collections, too, if you could use assistance with not only the layout but also complete measurements, another big bug-a-boo for many stampers! Hey, maybe that should be my next article for this series, eh? Leave me a comment if you'd love some insider tips on how the pros figure out their measurements. Gold Foil paper, Gold Wink of Stella, Copper embossing powder, Gold-stitched ribbon, Silver foil vellum, Copper thread, Silver Glimmer Paper-- I love using trendy metallic elements in my scrapbook pages and cards! It's just like a piece of jewelry, the finishing touch for the perfect outfit. Metallic tones add instant glamor, but every once in a while they strike a wrong note, and we don't always know why. Today I'm sharing several gorgeous samples that use metallics to great effect--and 5 rule-of-thumb tips for using metallics effectively in your projects. Balance the Temperature: Visually, metallics are "cold." Pairing them with colors that are "warm" often results in a pleasingly balanced composition. An exception to this would be Christmas cards--white and silver are both hard and color, but it works because of the wintery feel. Patterned papers also count as "warmth." Using vanilla instead of white as your main neutral will also help warm up metallics. Balance the Texture: Likewise, metallics are visually "hard." Sometimes projects look almost painfully sharp. Soften that edge with textured layers, ribbons and textiles, loops of twine or thread--all "soft" elements. Round the edges of your layers, or emboss tone-on-tone with matching metallic embossing powder and a heat tool. Know When to Quit: designers recommend that papercrafting projects use no more than ten percent foil compared to regular cardstock and paper. It should be considered an embellishment. Think "necklace" and not the main outfit. There's always an exception to the rule, but in general, less is more. Metal draws the eye--so keep it clustered and not scattered in all four corners. Just Add Texture: if you're using a larger piece of foil, it can be brassy and overwhelming to a project. The light reflecting off it can pain the eyes--not something you want when people are admiring your card! Cover part of it with a band of something else, or run it through the Big Shot with an embossing folder to reduce the shine and add interest. Mix and Match: The old rules about only wearing one color of metal at a time have flown out the door--you'll see lots of jewelry and purses in the stores today that blend gold and silver, or silver and copper. Fashion trends often find their way into papercrafting trends, and this is no exception! Split the time evenly when combining two metals so they don't "fight." But when combining three metals, use a 50-25-25 rule--more of one of the colors than the other two. There can only be one dominant in a group of three. I hope you've enjoyed these secret designer tricks, the fifth in my new blog series, Five Tips Designers Know. I love sharing design principles to help you grow in your skills as a crafter. If you enjoy tips like these, you'll love the Cheat Sheets Collections, too. Collection #18 was just released this week! Leave me a comment if you have ideas for future "5 Tips" suggestions. Spoiler Alert! It's up to you! Many times, when I'm creating a card, laying out my pieces and playing with placement, I have trouble making up my mind whether the card looks better one way or the other. Should it be vertical or horizontal? Back and forth we go. I finally get exasperated and glue it down, but later, every time I look at the card, I'll still be wondering if I should have done it the other direction. These are the dilemmas that cardmakers face, am I right? The truth is, it normally doesn't matter. There is no "right" answer in art. The only "right" answer is to get the card in the mail! Nevertheless, we papercrafters naturally want our creations to look as good as they can. I've written down some tips I've learned over a decade of professional cardmaking to give us some basic parameters for how to choose if a card should be vertically or horizontally oriented. But first, we have to know our terms! "Portrait" and "landscape" are how professional designers refer to height/width orientation. Portrait orientation refers to a card that has a width dimension smaller than its height dimension. Think of a painting of a person, seated stiffly upright. The first card, shown above, is portrait. Landscape orientation refers to a card that has a width dimension larger than its height dimension. Think of a painting of a sunset, wide and low. The second card, shown below, is landscape. It's all about the words! Landscape allows for a wider, shallower arrangement of your sentiment, while portrait restricts the words to a taller, narrower boundary. If your sentiment has a lot of words, or a long, sweeping font style, it will likely look better on a horizontal layout. Trying to visually squeeze them into a vertical one will look overcrowded. Likewise, a tall, thin sentiment will look awkward and out of place on a long, low card. If using a lot of different elements, choose landscape. Research on orientation in design by Wolfe and Horowitz (2004) showed that spreading out the visual "distractors" helped subjects identify the "target" (focal point) more quickly. It was harder on the eye to search out and focus on the important material when there were a lot of elements close together or the elements were very similar. Use color to help guide your decision. Does your most prominently colored piece run vertically or horizontally? Match the layout to that piece, no matter how big or small it is. The eye goes first to the color that "leaps forward" the most, and if the length and size of that piece is clashing with the way the card is oriented, it's going to be fundamentally discordant no matter how cute all the various parts are. Not sure which color is the most prominent? Try squinting at the card. One will intensify while the others recede. One size doesn't fit all. Ever flipped your smartphone on its side in order to fit more information at once on the little screen? You made a split-second decision to alter the layout in order to meet your needs. That can't be done once a card is adhered together, but if you're struggling with a layout during the pre-adhesive stage, turning it 90 degrees may be the answer. Still doesn't work? Try doing a "mirror image" flip of all your elements. The location of the key "white space" or "resting space" changes with every configuration you try. One of them will most likely be the optimal layout. Done is better than perfect. The most important factor in cardmaking is getting them done and in the mail. Every card teaches a lesson, even if it's just reinforcing good design principles we already know and enjoy. Maybe the lesson this particular, imperfect card teaches you is a subtle, even unconscious help towards doing better next time. Every project is another step along the path of developing our God-given creative skills and using them to bless others. Accept imperfection and enjoy the journey! I hope you've enjoyed today's mini-lesson on good design! You might appreciate the other articles in my brand new "Five Tricks Designers Know" series. You'd also love the design hints and tips I put on every page of my Cheat Sheets cardmaking helpers. Learn WHY things look better placed in certain areas, WHERE color combinations go awry, HOW to cut to make the most of your paper. Good design is within everyone's grasp! Thanks for visiting Song of My Heart today. In my experience, papercrafters either love combining colors, or they hate it! They're either quite confident in their choices, or they're always experiencing a teeny bit of apprehension over their decisions. Either way, they all love discovering a really great new combo that really knocks their socks off, because it makes everyone feel like a smashing crafting success when everything comes together. Did you know the color wheel has been around since the late 1600's? We can thank Sir Issac Newton not only for the law of gravity but also for documenting that colors in a prism follow a natural progression. So we've got all our colors, and they're in a logical order... now what? Here's 5 quick tips top designers know about combining colors! Opposites bring out the best in each other. Look for two colors directly opposite on the wheel, like red and green or blue and orange, and pair them in uneven proportions. Why uneven amounts? Because the two colors are equals and will "fight" each other for dominance. Use at least 75% of one and no more than 25% of the other. If you chose the "hot" color to be dominant, go with a cool neutral like white. If you chose to play up the "cool" color, use a warmer neutral like cream. Yes, colors have a temperature. Many studies show that people perceive blue and green rooms to be cooler than rooms painted yellow or orange, even though the rooms were exactly the same temperature. Whenever you have a "troublesome" color that is giving you problems, try combining it with other colors. If it's a "warm" color, choose a "cool" color to pair it with, and vice versa. Cool tones help spread the "hot" colors out and diffuse the intensity. Every piece of patterned paper you have in your possession is a "cheat sheet" for a great combo created by someone trained in color theory and design principles. Identify the main color, secondary colors, and accent color, and you're good to go. Check out the samples in catalogs and magazines for more. You might as well take advantage of the knowledge that professionals are already sharing every day. Use any accent color proportionally to all the other colors. As a general rule, designers strive for 50% main color, 30-35% secondary color, and 15-20% accent color. If there's four colors involved, it's typically 50% main, 25% secondary one, 15% secondary two, and 5-10% accent. Works for home decor--and paper projects! If you're having trouble breaking out of a color rut--that's ok. It must be a real knock-your-socks-off combo, or you wouldn't be so stuck on it in the first place! Try subtracting just one color out of your favorite "go-to" combo and subbing in a new color. Play with that one for a while, then do it again--take out one and sub in one. You'll be delighted to have expanded your repertoire but stayed within comfort range at the same time. Many people think they are "no good" at choosing color combos. Once you start looking at it as a matter of pairing warmth and coolness, considering opposites, and divvying up proportions, you'll find yourself much more pleased with your combining skills! When's the last time you ordered plain black cardstock? Maybe never, right? A lot of people don't realize the importance of black in a world with so many gorgeous colors and combinations. But good old Basic Black plays a crucial role in good design. It's instantly elegantly formal ... and simultaneously an authoritative, powerful presence. Learn to correctly use black in your cardmaking and improve your design skills today! "I've been 40 years discovering that the queen of all colors was black." Here's Five Tips that Designers Know about Using Black! Black can make other colors POP in a way that white never will.We have a lot of very old woodwork in our little cottage, that has oxidized over time to be nearly black. We thought we'd be stuck with neutrals forever, but vermillion, goldenrod, plum--they all look amazing next to the black. It works on cards and pages just like it does in house design. Black is typically used sparingly, for emphasis. It draws the eye nearly as irresistibly as a bold, bright color like orange or hot pink. You can experiment with this by laying out some swatches on a plain surface and squinting your eyes partially shut. You'd think you wouldn't even notice the black, but in actuality the eye goes straight there and only sees the brighter colors peripherally. Black can be super effective as a background color, as long as it's broken up with enough layers on top. Cover at least a third of the scrapbook page or cardfront with your other colors or papers. Subconsciously, you see the black first--so make sure you put clean, compelling design on top of a black background. Too frilly or busy will just cause the eye to divert to the background instead of your focal point or photos. Black recedes (pulls pack) from the eye. It will always look like it's retreating, even if it's the top layer. Sometimes that's good, and sometimes it's not, and that will depend on the designer and on the project. In small accent amounts, it doesn't matter. But if you'd layered too much black on top, your project will "fight" against you. There's a reason they say designers "work with" color. They're experienced enough to know when they've placed a color in a position that does not come naturally for it. An interior designer once told me that every room needed a bit of black in it, to "ground" the design and provide a frame of reference for all the other colors. I don't know if that necessarily has to be black, especially for cards and scrapbook layouts, but the principle of a deep coordinating shade to ground lighter, "flyaway" colors holds true. Really dark espresso brown, midnight blue, or deep charcoal gray can do the job of black. I hope you've enjoyed the little insider look into designer tricks of the trade today! My Cheat Sheet Collections are FULL of cool tips and hints like these for making your projects look more professional. Every one of the layouts comes with measurements, instructions, alternate suggestions and design helps. Check them out here on the blog or on Song of My Heart Etsy! Stripes can be kind of a "love-'em or leave 'em" design element--I've rarely come across anyone who didn't have a strong feeling one way or the other about them. While some of us have managed to get over the "avoid horizontal lines at all costs" cross-over mentality of out-dated fashion advice, others of us still struggle to use them in our crafting unless we set out for the nautical look. But stripes are fun, trendy, and fresh--and perfect for spring! They automatically add a sense of coolness and crispness in summer, too. I've compiled some tips for using bold diagonal stripes that I hope will help you use up those papers in the pack--they are there for a reason, after all. Designers don't just pull together paper assortments at random, you know! Stripes provide an important graphic foundation for many other patterns. Pair bold stripes with bold colors. Wimpy colors do not hold their own visually against dark, in-your-face stripes. Bright yellow, fire-engine red, Pacific blue, Kelly green--in general, avoid pairing with pastels unless you're using striped paper made from those shades. Go monochromatic! Keeping all your colors limited to one shade plus neutrals automatically lends elegance and tones down the "shouting" feeling that stripes can sometimes project. Don't be afraid to mix stripes and other patterns. Geometrics have hard lines, like stripes, triangles, chevron, or hexagons; prints include all florals and anything with softer lines and curves, like polka dots or script. Take one print from each category and you can't go wrong. Intersect your diagonal stripes with a horizon. Clearly defining the limits of the pattern help the mind know what to expect and feel orderly instead of chaotic. Play with the direction. The eye travels naturally from left to right and top to bottom. Sometimes it makes ALL the difference in the world if your stripes are helping the eye or resisting it. It can be the difference between your scrapbook title being read or being ignored. Love design tips like these? My Cheat Sheet Collections are FULL of cool tips and hints for making your projects look more professional. Every one of the layouts comes with measurements, instructions, alternate suggestions and design helps. Check them out here on the blog or on Song of My Heart Etsy! I've used a variation on the design from Cheat Sheets Collection #14, released this week, for the cards in this post. They make design SO easy!